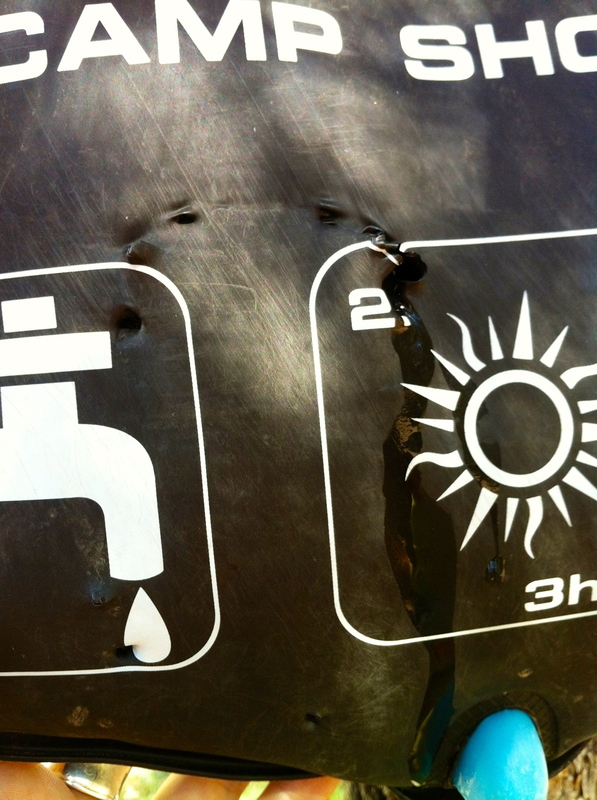 Our heavy duty camp shower was no match for the sharp incisors of a curious black bear. So, in a follow up to yesterday’s post, I must finish telling the whole bear story. After I wrote my blog yesterday, I asked hubby if he would fill the camp shower so I could wash my hair. Being the extremely dutiful and kind gentleman he is, he walked himself down to the tree where we’d left the shower hanging overnight. “What? Why?” I questioned, knowing we’d only used the dang thing once before and that it had been fine last evening when I’d relocated it to a tree nearer to our camper. “It’s got teeth marks in it,” he told me. Then it hit me. With all the bear commotion, perhaps the teeth marks belonged to a bear. I went to investigate. Sure enough. The bag, hanging at least five feet off the ground, had puncture holes in the shape of a large animal mouth, the deepest wound had been caused by large incisors. Crap. We were down one camp shower. Oh well. I would make it without a shampoo. We went out for the afternoon for a nice hike to Spud Lake (technically it’s Potato Lake, but locals have nicknamed it). When we returned, there was more bear commotion while Joe fished. The bear was sighted again in a campsite and subsequently shooed away with banging pots. We thought it might be best not to cook dinner at our site and opted instead to cruise down to Durango for some barbeque. Again when we returned, we ran into the campground host who told us that a bear and a cub had been lurking around all day. We talked it over and figured that if the bear had visited our campsite the previous night and not disturbed a thing but our camp shower, despite the fact that we had cooked and eaten inside our pop-up due to the rain, we were probably safe. After all, we had eaten out, we were tired, and we had bear spray. No worries. We fell asleep in our camper, exhausted and dirty, before 9 p.m.
At 11 p.m., Steve and I were rudely awakened by the shouts of a fellow camper. This time the voice was female. This was followed by the echoing sound of pots and pans being banged together. A few more shouts bounced through the campground and then it got quiet. Steve and I sat waiting, listening for bears, presumably. We wondered where the marauders would hit next. About ten minutes passed while we discussed our plans in case of a bear visit. Then, three quick popping sounds rang through the campground. Gunshots. Apparently someone had decided to try another tactic to scare away the bears. Steve and I sat looking at each other, weighing our options. These bears were not going away. I imagined a night filled with intermittent yells, barking dogs, and banging pots. I contemplated the drama that would ensue within our own campsite with our boys if the bear came knocking on the door of our pop-up. Certainly, any incident in which we actually had to deploy the bear spray would result in hesitancy from our boys the next time we suggested a camping trip. While I sat trying to decide what to do, the occupants of two other campsites made up their minds and drove out of the campground for the night. I started wondering if they had the right idea. Knowing that we had a 7 hour drive home today and fearing that we would decimate our kids’ love of camping forever if we had to pepper spray a nosy bear while they watched, we woke the boys, grabbed a few essentials, and vacated camp. We drove into Durango where a lovely clerk at a Quality Inn gave us a discounted “bear” rate, two care packages consisting of bottled water and cookies, and keys to a room with two queen beds and a welcome policy for our canine. By midnight we were bear free, and the boys were back asleep. I won’t lie. We slept well in those soft, comfy beds without banging pots and pans and gunshots and panicked shouts at an ursine visitor. Sure. We’d spent some extra money, but the peace of mind and decent night’s sleep were going to be worth their weight in gold. Sometimes you need to know when to cut your losses. It’s early fall weather in the high country. Some aspens are changing already. Food is scarce, and those bears are looking to fatten up for hibernation. We’re in their territory with our easy meals. You can’t really blame them for wanting to capitalize on our intrusion. When it’s all said and done, when you’re out in nature you’re part of someone else’s home. In this case, the someone else consisted of some hungry bears with pointy incisors and cravings for sweets. I think it was right to respect their space and vacate for a while. Besides, staying at the Quality Inn fueled the local, Durango economy and gave me my first hot shower in four days. Bears were happy. I was happy. It’s all good. At least, that’s what I’m telling myself tonight as I look back on our four-night camp trip that became a three-night camp trip with an optional hotel stay.